I dedicate this study to all who have helped me along my academic path and to those who will support my future research. Even though a lot of colleagues got “lost somehow” during my studies, I still want to remember their superficiality as a monument for corrupted behavior in society. Furthermore, I want to thank my family - who has always encouraged me - and commemorate the departure of my beloved Merlino (*1996-†2013). In addition, I have to point out Prof. Finsinger, who has rekindled my passion for economics and research, amplified my interest in uncommon topics and shared experience combined with expertise. Finally, I want to express my gratitude and appreciation to Andrada, my partner in love and in science, who has never forsaken me. The energy sector is figuratively seen the motor of not only (real-) economy, technology, machinery, but life itself depending of the definition of standards of society. In such an important field corruption leads to multiple negative results such as a decreased speed in technology research, health issues, decreased life standards, monetary losses, (partially permanent) damages to the environment and also spreads out to other sectors (as higher prices for energy may enforce less competition in various business areas, which is less beneficial from the point of view of total social welfare). The incentive to use corruption methods is rather high reasoned by (mostly) ineffective counter-measures, powerless regulation agencies, inadequate penalties (or even immunity), a history of “corruption culture” and mostly a disrupted government. The objective of this research is to depict the energy sector environment regarding the various sources of energy, the correlation of energy mixes, various trends of transition and mainly corruption of these preceding aspects. A view of successful probable and failing counter-measures will also be provided. The introduction enables a broad outline of deregulation, regulatory agencies and the process of restructuring in aspect to corruption. A unique part will be the comparison of the general corruption in the public sector of various countries and the perceived corruptive behavior in the energy sector. Considering the setting of the energy sector, namely the attribute of supra-nationality and its cross-linking to the financial sector, the greater cases cannot be limited to countries (or even small time frame). The definition of corruption will be discussed as well and is absolutely crucial to fully acknowledge results of various methods which cannot always be accredited directly as the main nature of corruption is secrecy. The probably most interesting part is the collection of extracted key factors where “entry points” of corruption are indicated, analyzed and referenced. A focus on clarification of misinformation is emphasized as well. 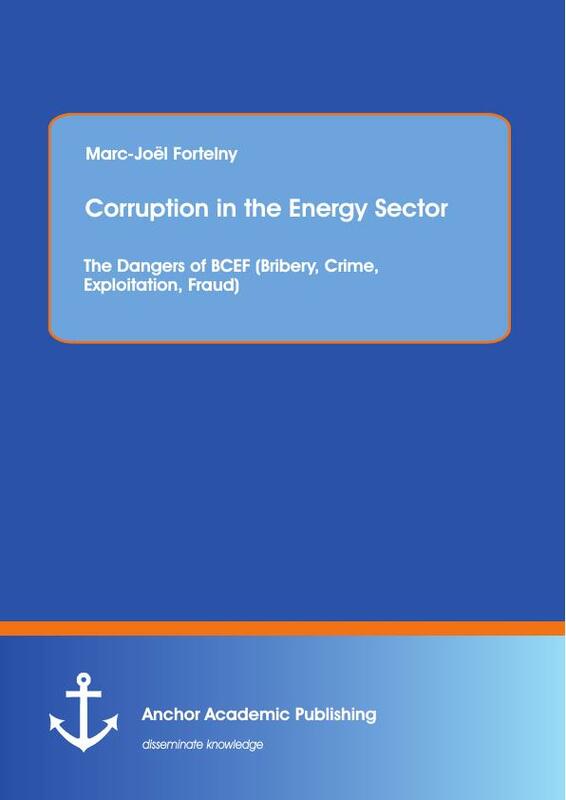 This study should provide a solid overview of the relation between corruption and the energy sector, numerous cases or certain methods and a few focused and further discussed details. In the last decades the energy sector has endured vast regulation changes concerning deregulation, liability adaptations and structure – even if most of the parts (inventions like electricity for instance) are, historically seen, quite new like the theory of economic regulation which dates back to the nineteenth century. The main goal of an efficient regulation nowadays is to adapt to the global requirements of a responsive and flexible system. A regulatory board should not only monitor the regulation methods and their respective usage, but also the environment of the firm, its respective operating sectors, its investments and its long-term strategic planning. Some of these examples and their underlying principles will be analyzed in later chapters. A broad overview of the difficulties that a regulatory institution may encounter should be achieved. The cases of California, Turkey, Ukraine and South America will show that the problems of regulation in fact do not rely upon the simple application of methods and monitoring. The system of an energy market has to be stabilized on all of the different parts of the distribution chain. When the financial market intersects with the energy market the nature of its fluctuations logically produces instabilities such as abundance, which results in profit loss of a firm and shortage which affects the consumer negatively either in a higher price or life standards perceptible, like the oil speculation for instance. There is an academic discordance on this topic. The tasks of these institutions are numerous and sophisticated. An absence of influence cannot be guaranteed regardless of the political system, the degree of technological advancement or the level of bureaucracy. The negative side of such an influence is not always “classic” corruption but a circumvention of the regulatory framework. Hence, the regulatory lag must be as little as possible to minimize losses either of the firm or the society. Usually the utility firms are in favor. The main goal of a regulatory agency is to find a regulation that exceeds its costs of appliance by the benefit. Naturally, the costs are two-sided, whereas the direct costs are minuscule and the indirect costs can be extremely high. The other question is if without regulation the prices would be too high overall and/or the situation would be anti-competitive by meaning of an artificial monopoly, which is rather complicated in a sector of natural monopolies, a strict regulation is necessary in the first place as various scientists favor deregulation. When an energy sector is privatized, its firms can be bought by private companies usually via a monopoly concession. The decision of which is the most suitable operator is heavily influenced by the rating system (factors are weighted) and the bid sum. A misdetermination may result in an impossible situation for re-regulation and adaptation to an efficient system. There are various instances of regulatory boards which can be directly linked to a ministry of energy, nature and environment, or rather independent. The controlling areas comprise the direct or indirect setting of the price, the revenues and operating areas of the firm, the investments, quality reassurance and sustainability. The financial market to that extent is far more difficult to control where the major tradeoffs are done by middlemen and not by both ends of the chain. Without going into too many details, the history of regulation in electricity is relatively brief. In the U.S. the first regulatory agency was already founded in the 1900s and was called Federal Energy Regulatory Commission (FERC) - the definition of an overall energy sector and its regulation followed decades after. The creation was also based on the necessity of a stable procurement, which was not possible with the occurring franchise system that prevailed the first decades. The FERC´s are different institutions in different states with different rules such as the conduction of transactions regarding electricity and natural gas. Natural monopolies existed due to the nature of the sector. These resources were considered to be too important to not be regulated. This has changed with the commonly split of the unified monopoly in three subsectors (generation, transmission and distribution) in the 1990´s and tested the strength and authority of the regulation boards. The European Market has its European Regulators´ Group for Electricity and Gas (ERGEG) and its respective state related regulatory boards like E-Control in Austria and the “Bundesnetzagentur” in Germany. Deregulation or privatization have been controlled by the EU government more or less carefully and as unified as possible – adapted to the market situation and stability. When compared to the U.S. market privatization it seems private firms have not succeed in having more efficiency and lower prices than state owned utility companies. Privatization has a tendency to be corrupted in the process, especially if the regulatory boards do not have enough political power and independence. Resulting from the calculations of this table, it can be stated that the prices of deregulated states are significantly higher and thus consumers are far worse off. There are many examples where the privatization did not work as intended, but also numerous where the liberalization process was successful. With this example only a tendency can be perceived but not the general probabilistic outcome as too many factors of the environment and the circumstances have to be (re)considered. Summarized however it can be definitely emphasized that privatization processes are entry points of corruption, inefficiencies and exploitation. Before an analysis of the topic’s combination of corruption and the energy sector may be performed, it is absolutely crucial to first examine each of those individually. Examples though include the “cohesive partner” as well. “Wrongdoing on the part of an authority or powerful party through means that are illegitimate, immoral, or incompatible with ethical standards. Corruption often results from patronage and is associated with bribery. Various similar descriptions are used when outlining corruption often without considering the echoes and different ways of impact - the incentive of corruptive behavior on the side of the authorities are on the one hand assurance of maintaining that position and on the other hand gaining benefits for “distributing” this power. Generally speaking, the first result of such actions is a reduction of the (total) social welfare. However, this is not a short term and not even necessarily a monetary problem as such patterns are highly likely to induce a spiral. As a matter of fact, sufficient and preferably adaptive counter-measures are necessary to intervene and limit such actions. The exact classification of the area of corruption is rather difficult as such arrangements may occur randomly in different sectors and transits may occur to the energy sector indirectly and become unidentifiable. Cases where bribery was involved in a monopoly concession auction are quite common, nevertheless mostly unknown to the public. The probability that the corruptive behavior of only one local politician affects the energy sector on a huge scale is quite low but surprisingly possible (examples in the cases later on). In this sector disruptive patterns are generated by conglomerates’ lobbies, collusive partners in industries and politics, councils and greater political institutions (like the European Parliament or the House of Senate). Another more deceiving part of manipulation is the desire to misinform and misinterpret “data”. Not every technology reaches its predicted heights or wasn’t even able to, in the first place in its current state of evolution (for instance debates about potential of wind farms). In the following chapters examples will determine how corruption shatters technology capabilities, waste energy, gamble in the financial markets etc. The determination of corruption levels will be expressed and explained in the chapter of “The geographical Analysis” via the Corruption Perception Index (CPI). The organization of “transparency” explored and researched the corruption of public sectors worldwide since 1996 while at the same time providing not only the results of their data but the process of collecting data, the weighing methods and the interpretation of this data as well. As the characteristic of corruption is to deceive and hide its true nature this logically results in difficulties to measure it. As an example the inflation of potatoes in Central Europe originated in Germany from the three biggest “competitors”. In collusion they achieved a price increase of over 40%. Interestingly, this was the second highest price increase and has been proven to be corrupted while the number one good (onions) seems not to have been discovered or researched. In this case, measuring corruption would be either an estimation based on statistics (similar to a statistic correlated to drug use of professional athletes) or an investigation where in- and outputs have to be recalculated which is a difficult and, depending on the scale and frequency, very costly method. Summarized, it can be said that statistical data indicates possible corruption and with sufficient data, may even define a more refined area of corruption. The effects of corruption are wide spread in the energy sector due to various factors. Not only is this sector (disputable) the most important economic base factor but also paradoxically a technology based “technology enabler”. Therefore irregularities produce technology setbacks (decrease of research speed), a reduction of businesses’ growth (California case closure), carbon footprint (comparable to future costs that are shared globally) and also global turbulences of financial markets. As there are numerous scientific specializations of economics (for instance lean management, sustainability, cost-benefit analysis etc.) corruption itself is not in-between. Because it is mostly hidden and not/or difficult to measure, depict and express even if there is a hub of research for corruption (transparency.org) a specialization has not been established in the studies of economics resulting in a “lack of” research compared to other topics. Inevitably, the area of effect is indirectly noticeable in every technologically driven village, city or society as there are no “substitutes” for energy (compared to food). As a matter of fact, the area of impact is global. The most prominent factor of the theory of regulation is the choice and adaptation of a suitable method. While each of these methods have their strengths and weaknesses their correct and persistent implementation is the key to success in creating the most beneficial outcome for the social welfare. This however will be just a short review of some of the methods as the more problematic part of corruption is the environment, the circumstances, the risks and the opportunities of regulation methods. Often the strict observance of efficient methods is already the first obstacle and/or collapse of the system. When a firm naturally aims for profit maximization a control board has to be set against an unfavorable position of the consumers/ society. The task of setting an optimal regulation which leaves the financial capabilities and flexibility intact, while at the same time ensuring quality and a “fair” price, is comparable to Sisyphos, due its nature of the persistent struggle of enforcing a continuous work. This type of regulation focuses on maintaining the characteristics and especially the advantages of a competitive market in a monopolistic one. The goal is that firms are allowed to make profits, but only up to a certain rate. They can manage their input into the company on their own, the resulting output or the price to which they want to sell, as long as the revenues do not exceed the pre-established level of return. This is a much-criticized model. The first ones that put this under scrutiny were Harvey Averch and Leland Johnson who declared in 1962 that a company trying to maximize its profits under these conditions would fail to minimize its costs. In contract to an unregulated company, that would strive to use both capital and labor efficiently, a firm conducted under the rate-of-return restriction would employ too much capital at the expense of labor. The choice of the revenue cap over the price cap normally induces a fixed or known quantity. As different regulation methods were implemented, that were not always advantageous for the companies’ financial developments, an urge arose to create something that would bring gains. As the name states, this type of regulation implies setting an upper limit for the prices firms are allowed to charge. It is a formula that subtracts the expected efficiency savings (X – average value based on the past performance of companies of the same sector) from the Consumer Price Index (CPI) thus attempting to reach the level of the overall rate of inflation of the economy. As the savings are fixed, this method is supposed to create an opportunity for companies to maximize their revenues and pass the surplus to their shareholders. Historical data has always proven to be very significant for studying purposes in any business sector. Naturally, this is also used as a method of regulation. Statistical, past information is gathered and with the support of specific mathematical models, the data can be analyzed and structured in such a manner that benchmarks can be set and even future events predicted. The selection of the appropriate data and the underlying model is of utmost importance because misinterpretation can lead to significant losses. For regulating purposes, five types of metrics are differentiated and put in practice. The Core Overall Performance Indicators relate on information available to the general public, such as output per employee, usual key performance indicators as ROACE, ROI, revenues. These financial criteria fail to identify relations between the different factors, reason why regulators often chose to ground their studies on Performance Scores based on Production and Cost Estimates that highlight the best and worst performers out of a group. The Virtual Company Approach tries to set a baseline for measuring performance, but it faces the challenge of distorted company information and the Process Benchmarking Concept that focuses more on management concerns rather than economic outcome. The last one is the Customer Survey Benchmarking that is on the one hand constructive, because it depictures the current view of the customers, but is highly inconclusive because the consumers can be easily manipulated and therefore little concrete payoff can be gathered. Also called profit sharing or sliding scale regulation, this is another form of government that involves, as the name states, sharing of gains between the company and its consumers. Of course, the regulated firm is allowed to keep its earnings as long as they do not exceed a pre-established rate of return. Should this happen, the excess revenue will be returned to the customers, either through the means of direct payments or by lowering the prices. Nevertheless, should the firm generate much too low profits; these losses will also be shared with the consumers, generally by increasing the prices of the products. The total structure of energy markets is worthy of a separate research due to its complexity. This chapter is a mere focus of points of interest and requires additional literature to fully understand the inter-connectivity, relations and interdependencies. The following info graphics depict the U.S. energy market in relation to the efficiency of usage, energy potential and certain indications of trends (which have to be interpreted). First of all, the agreed term of BTU is rather confusing to the rest of the world which is using the metric system; nevertheless this unit remains sufficient if it is used persistently in comparison: a BTU (British Thermal Unit) is defined as the energy used or the potential used to heat one pound of water one degree Fahrenheit. The energy levels shown below are stated in quadrillion BTUs. The U.S. market shows a rather great inefficiency regarding the level of wasted energy, which is approximately 60%. As a side remark, the term “American energy spectrum” is incorrect as it is in fact referred to the United States, which is a common mistake in the terminology of U.S. Americans. The U.S. electricity sector shows the effects of massive lobbying (which has always been strongly developed in the U.S. history) as the dependence of finite resources is at a very high percentage of nearly 90% which cannot be defined as “sustainable” considering future transitions. The 22% of the nuclear sector depends on finite resources but in a completely different level regarding the classification of the energy potential compared to its mass. Fossil resources have an “expiration date” due to their heavy dependence worldwide and are doomed to extinct in decades or centuries according to various calculations which differ greatly due to contrasting use of methods, estimations and approximations (see chapter 7 “Extracted Key Factors”). The arguable part in this constellation is if corruption does actually occur or not despite obvious indications of irregularities (depending on the viewpoint). An argument against this would be that those finite resources have been proven to be the most cost and energy efficient possibilities. The high level of waste, namely 70%, is generated by the over usage of finite resources. Another necessary statement is the clarification of the (nearly) total absence of solar power (See “Extracted Key Factors”). Surprisingly the announcement of increasing growth of several hundred percent is in fact a barely measurable amount compared to the total usage of other sources which is explained by the poor base level. The diagram above shows the percentage of the end users (namely 43.6% industrial, 22.5% residential, 17% commercial and 16.9% transport) and points out as well that electricity and transport contribute over three quarters to the total wasted energy levels. It has to be noted that there is a strong interdependency of end users, when for example a good has been produced in the industrial sector, is then transported to a residential end user which then has steady energy consumption with it. Therefore the indirect contributions are not that transparent. Aside from the high “wasted” level, the percentage of electricity is only at a remarkable level of 0.1% which indicates on the one hand the significance of ship and air transportation and the automobile industry but also a certain insignificance of railway transportation and the electric motors (see “Extracted Key Factors”). The European Energy market is quite different to the U.S. market in two major aspects which are the policies and the goals. The European directives and policies are developed in a totally different mindset. The European government has acknowledged (officially) the finiteness of resources/ capacities and the necessity for sustainability. The following graphic pictures a collaboration for more energy efficiency in Central Europe which is based on a rather small investment budget but high potential for a better energy use with the already existing institutions, networks and sources in contradiction to the U.S. energy market which tends to “only” render new accessible sources. Additionally, those energy projects are co-financed, therefore less risk prone and in correspondence with regulation “smart investments”. The more noteworthy part of the outline of the European energy market is the power shift regarding the share of energy from renewable sources. The following graphics contradict statements such as “renewable energy is not as efficient…”, “renewables are far more costly”, etc. Before further investigating this transition it has to be noted that the corruption part in this matter is the misinformation of actual energy possibilities on both sides, namely the under- and overestimation (which will be further discussed in “Extracted Key Factors”). In the long run energy production has to be made out of renewable sources without the aspect of nuclear power potential. The problem of this framework is that energy demand has a certain fluctuation and renewable energy production has very distinguishable characteristics, such as weather –affection, accessibility and transferability (see “Extracted Key Factors”). Every European country agreed to increase their renewable energy production percentage level according to their capabilities. When the different levels of 2009 and 2010 are analyzed, the aspect of total energy production has to be considered as the percentage is compared to the total amount. A rough approximation of the graph below indicates that countries with a higher (20 and above) percentage of renewable energy have set lower growth goals, which may correspond to the knowledge of their possibilities. If a country wants to double or triple etc. their percentage level in a mere decade, the likeliness of success is low as historical examples in various sectors and time frames have shown. An overall transition (according to figure 9) can be identified as the shift from oil and petroleum, solid fuels and nuclear sources to gas and renewables has taken place which is and was also induced by European directives. Major changes in the energy mix and therefore in the infrastructure and market itself cannot be performed in small (too small) timeframes due to a lot of factors particularly the increase in gas is explained by the European government as the stability factor for providing a steady production when the more fluctuating renewables are increased. The shaping of a public opinion (that gas is more or less also classified as a clean source like renewables) is scientifically seen confusing but politically seen explicable. This can be defined as a compromise as the transition to renewables is not yet possible without a stable energy production based on a finite source. In figure 10 tendencies of an increase in renewables overall can be identified where Austria and Denmark have the greatest increase in a renewable percentage and a decline in the rest of the sources. However, Denmark had the steepest rise in renewables due to the rather low starting position. Interestingly, Cyprus with an extremely high percentage in oil and petroleum indicates a strong dependence and an inflexibility to change. Ireland and Italy are the examples for fossil fuel swap of oil and petroleum to gas transition with a very small percentage change of renewables. Some of the countries are just more or less stable in their energy demand and production like Finland, for instance. France is one of the few countries which had an increase in oil and petroleum, while at the same time showing an extreme reliance on the nuclear energy sector. An overall increase in gas power is identifiable with only a few exceptions (Hungary). Malta is very similar to Cyprus considering the lack of variety which resembles purposely on the lack of investment. Norway shows a high level of renewables but also an increase in oil and petroleum which is logical when facing an abundance of resources. Turkey’s unique position, geographically seen, is too compelling to not overinvest into gas energy production which explains the shift of the only increase and the greatest decrease in the renewable percentage of all countries (one of the few decreases in general). Sweden has faced a certain barrier in efficiency with enlarging the renewable portfolio while reducing their nuclear and oil petroleum levels and trying to stabilize the market with a steady growth of smart grids and high yield renewable projects (smart investments). The general trend of increasing the renewables’ percentage was induced by subsidies from new projects in their construction and in their energy price. While the countries increased mostly the renewables, they often balanced it with an increase in gas which is propagated as the cleanest solution of the fossil fuels. 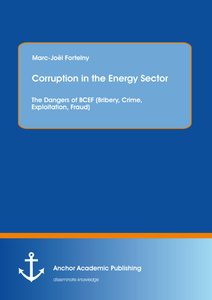 This section deals with a combination of research knowledge regarding general corruption in the public sector and more or less specific corruption in the energy sector. The goal of this comparison is to identify a correlation or a tendency of coherency between them. The main source of scientific papers is the organization of Transparency which has a unique way to identify, indicate, measure, evaluate and repel corruption. These tests are differentiated by nationality and internationality. Before analyzing the methods and results of the CPI (Corruption Perception Index) the history of transparency.org is worthwhile. In 1993 Peter Eigen, a retired World Bank official, founded together with nine allies the small organization now widely known as Transparency International in Berlin. In the early nineties corruption in development projects was usual and a so-called “taboo” topic. The main inspiration for the foundation was Eigen’s experience in East Africa. In the following years global recognition, corruption as an input for the world agenda, law changes for foreign bribery (made by the OECD) and many more changes were achieved. The two most influential publications were the so-called CPI and the TI Source Book (TI stands for Transparency International) which has been issued the first time in 1995, while the CPI is issued annually. As the approval and the respect of the anti-corruption movement has risen, the funding and the participation enabled greater amounts of data, surveys, research in general and also other methods, like the Bribe Payer’s Index (BPI), various reports etc. to be published. So in fact the CPI only resembles the perception of business people and country experts in a range of a pre-determined way to capture the levels of corruption. Each country has to have at least three different sources for building a CPI. In 2012 nearly all of the countries were evaluated except those in white (in the graphic below). The performance points from 0 to 100 indicate the measurement from highly corrupt to very clean. In the beginning only a few countries participated with much less material/data. The main concern of this chapter is to determine if a tendency of the CPI is coherent with the performance of the energy sector. This comparison is experimental, because both analyses are based on a mere perception or trend. The reason for this is the nature of corruption which has been explained before. Therefore absolute levels of corruption are not achievable and have to be simulated via statistical estimations. (For further details the link http://files.transparency.org/content/download/534/2217/file/JRC_Statistical_Assessment_CPI2012_FINAL.pdf) Additionally, every other research aspect is fully available in detail on the transparency.org hub. Furthermore, it has to be stated that public scandals through the media influence affects the CPI rather strongly. The first country examined is Russia with a rank of 133 (out of 174 rated countries) and a score of 28 (measured by CPI). The exact reasoning for this score would be too complex to discuss in detail (or every other country). However, the current state of Russia regarding its democracy level, the presence of bribery (further discussed in the following sub-chapter), a history of corruption (transition from communism to capitalism) and a lack of corruption penalties (in number and amount) with several recent scandals such as the Hydro Power scandal are sufficient reasons. The energy sector of Russia is quite consistent; the performance of this sector is relative coherent with the CPI considering the inefficiencies of distribution and production of energy (also caused by resource abundance). The overall performance improves when only revenue is evaluated and huge losses caused by corruption are ignored. A lack of future investments and smart grids, renewables (sustainable energy) and so forth, round up a rather negative perception of Russia. Anti-corruption movements have started already, but before they can be successful on a bigger scale the mindset has to change regarding efficiency (wasting). India is a more difficult example with a rank of 94 and a score of 36, but a far worse operating energy sector when the focus lies upon the electricity part. With the recent massive power shortages and instabilities of the grid, a mismanagement of this particular part of the energy sector is obvious even if according to study of KPMG the energy sector is perceived to be as the least corrupted sector, study which has been published before the last scandals. Therefore the perception has likely shifted as well. This example is so difficult to explain in short as the history of India and its energy sector is and was heavily influenced not by market mechanisms but by political decisions. The misinvestments of Enron, for instance, still take its toll on the energy supply. It is arguable how great the influence of corruption is on the energy sector, but its involvement is undeniable and in this particular case, has even been prognosed beforehand. As a side remark, it has to be stated that shortages of a real good become far quicker apparent than, for example financial inefficiencies. Denmark is the perfect example for a nearly corruption free nation that pursues persistently its future goals. Compared to other nations, it was free of scandals and the performance of the energy sector has been measured as very efficient. Denmark has also a very promising energy mix towards renewables (percentage- wise the greatest increase – as shown before in chapter 3.2). Denmark is ranked as number 1 and scored a CPI of 90.